An incredibly intricate story with the honourable art thief Tom Grip as the main character. Along with his friend Jonathan, Tom committed sensational robberies until Jonathan died during a heist in Thailand in 2012. 2016: Denmark’s most expensive painting is stolen from Copenhagen’s Art Museum. Jonathan’s father commissions Tom to find the painting, but he only has 28 hours – the painting is secured with a mechanism that will destroy it if it is not put back into place in time. Jonathan’s father is the “King” of Denmark’s underworld. His Swedish nemesis the “Khan” wants to demonstrate his power over the King by stealing his favourite painting. What the Khan does not know: a stranger took out a member of his crew during the robbery, taking his place and disappearing with the painting after the successful mission. And so begins a chase, in which both sides are hunters and hunted at the same time. No one can trust anybody and everyone has their own agendas. When Tom succeeds in figuring out the game at the end, he does the utmost to avoid more casualties, even when he has to revise important information about Jonathan’s death. 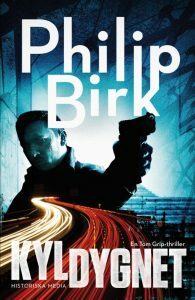 Philip Birk was born in 1993 and studies Law in Malmö. His debut Thriller »Kyldygnet« is the start to a series starring master thief Tom Grip, published by Historiska Media. Philip’s grandfather, who was the director of the Randers Art Museum, known for displaying the painting “Interiör” by Vilhelm Hammershøi, indirectly inspired him to write this story. The German Publishing House Europa Verlag will publish the book in 2019.